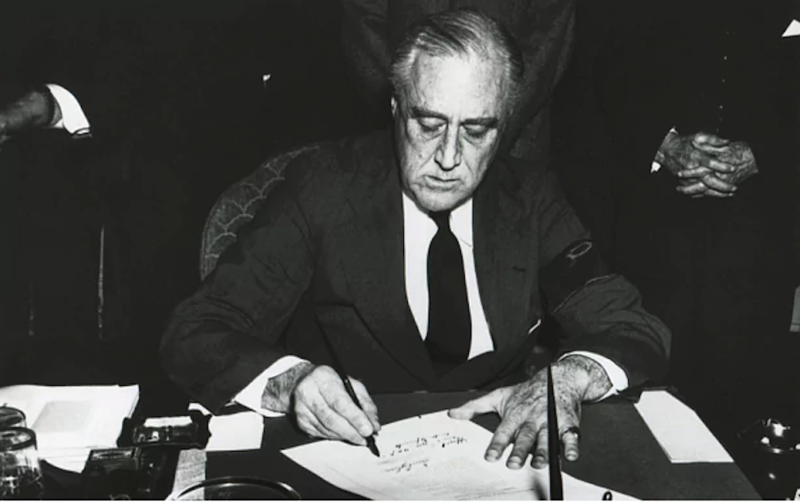 President Franklin D. Roosevelt signing the declaration of war against Japan, Dec. 8, 1941. Courtesy of the National Archives and Records Administration. In recent months, president-elect Donald Trump has said he is considering setting up a registry to track Muslim Americans and foil jihadist plots from being hatched in the United States. This registry, he and his aides have claimed, is grounded in precedent: Franklin Roosevelt’s administration detained approximately 120,000 Japanese nationals and Japanese Americans in response to Japan’s surprise attack on Pearl Harbor. Coincidentally, this February 19 marks the 75th anniversary of FDR’s Executive Order 9066 setting up the camps. The Franklin D. Roosevelt Library in upstate New York is devoting an entire exhibit to FDR’s internment decision and its impact on the lives of internees for the first time in the library’s illustrious history. The exhibit, “Images of Internment: The Incarceration of Japanese Americans In World War II,” will be ready for public viewing February 19, and will run through Dec. 31, 2017. In the meantime, it is worth reflecting on President Roosevelt’s role in and his reasons for setting up the internment camps. Trump, after all, described Roosevelt as a revered leader who was nonetheless responsible for setting up the internment camps. The then-presidential candidate suggested that if one of America’s greatest presidents could take such a step to defend lives, then Trump reasonably could crack down on Muslim Americans for the sake of security if he were to win the White House. The internment decision represents one of the great paradoxes of FDR’s three-plus terms as president. Roosevelt was not just an architect of the New Deal but also a champion of human rights and individual liberties here at home and around the world as the crisis of World War II encroached on the United States. Faced with the growing power of fascist militarism, Roosevelt declared in his 1941 Four Freedoms address that “the mighty action that we are calling for cannot be based on a disregard of all the things worth fighting for.” Indeed, he then cited “the preservation of civil liberties for all” as one of these fundamental democratic values that was worthy of national sacrifice. The puzzle of his presidency is how a man so responsible for defending freedom against the totalitarian menace—whose wartime addresses stirred millions of people to defend the cause of liberty—could simultaneously authorize and implement one of the greatest civil liberties abuses in American history. In the wake of the attack on Pearl Harbor, the political pressures on Roosevelt to take drastic action against Japanese Americans on the West Coast metastasized. Popular fears of imminent air raids, widespread espionage and land invasion combined with entrenched anti-Japanese racism, especially in California, Oregon, and Washington state, into a combustible mix in the uncertainty that defined the days following the bombing of Pearl Harbor. The puzzle of FDR’s presidency is how a man so responsible for defending freedom against the totalitarian menace could simultaneously authorize and implement one of the greatest civil liberties abuses in American history. A group of Army officers, fearing that invasion was imminent and under pressure from nativists in the Western United States, pressed the White House to remove and incarcerate Japanese nationals and Japanese Americans on the West Coast. Roosevelt was kept abreast of the fast-moving debate about the fate of Japanese Americans on the West Coast, and the voices in support of internment proved far louder and politically and militarily more potent than the arguments made by interment’s opponents. When Biddle and other Justice Department officials were assured by the Army that the military and not Justice would be responsible for implementing and running the camps, they withdrew their opposition to Roosevelt’s executive order. That order, numbered 9066 and signed on February 19, 1942, did not explicitly mention the Japanese, but there was no question that it targeted people of Japanese ancestry for removal rather than people of German and Italian origins. The decision was hardly motivated by legitimate threats to the national security of the United States. Almost all historians have concluded that there was no evidence in the early 1940s—and that no evidence has emerged in the seven-plus decades since—showing that Japanese nationals and Japanese Americans were acting as spies or that they were part of a larger plot aiding the Emperor’s war effort. The notion that national security considerations justified the camps is simply contradicted by the voluminous historical evidence to the contrary..
During the 1980s, a committee established by the U.S. Congress to investigate the history of the internment camps concluded that they amounted to “a grave injustice” born out of “racial prejudice, war hysteria, and the failure of political leadership.” The most glaring abdication was the failure of Franklin Roosevelt to defend the rights and liberties of tens of thousands of his fellow citizens as he was pulled along by the tides of hysteria and racism 75 years ago this February. Matthew Dallek, an associate professor at George Washington University’s Graduate School of Political Management, is author of Defenseless Under the Night: The Roosevelt Years and the Origins of Homeland Security. This essay is part of a Zócalo Inquiry, Why We're Still Reckoning With Japanese American Internment.